Fix PC Games: Far Cry 3 savegame problem "can't continue/load game"
Far Cry 3 savegame problem "can't continue/load game"
If you experienced problem with Far Cry 3 savegames and can't continue, there is only option "New Game" then you may follow these steps. I was mad and tried all, wondering how the hell I can fix this savegame thing and bam here it is. 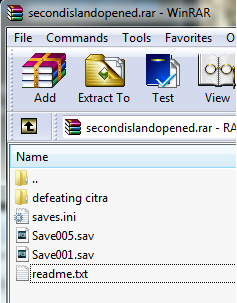 Two of the download links you have provided are the save game files. The third downloadable thing is a strange folder named M5zMr0 which contains strange subfolders and strange files without extensions. There is nothing that is downloadable that looks like the stuff in the second image you posted. There is no "read me HOW TO", "copy.png", "to copy.rar" or "block firewall.png". Please reply, i will check this webpage often. Step nr. 8 is the one that's not working for me. "This" that I need to download is just the same save files as in the other download links. I put the downloaded save files in the orbit\46 folder, but the game still does not recognise them. I still can't continue or load, and have to start a new game every time I exit the game and restart it. I always run as administrator and I've unmarked everything as read only and set everything to full permission. Hiya there. I have a question. 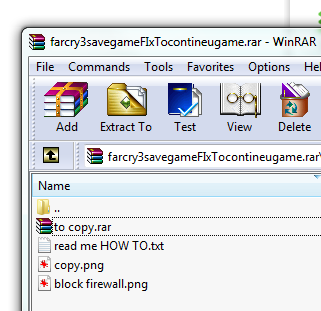 Inside the file: FarCry3 all savegames.rar there is a file named: nu sav.rar where all save games supposed to be but this file is protected by password. Can you please provide it? Thank you a lot for your great effort about this fixes and guide. Best, D.